Let’s check in on how Consumer Confidence and mortgage interest rates fared during July. 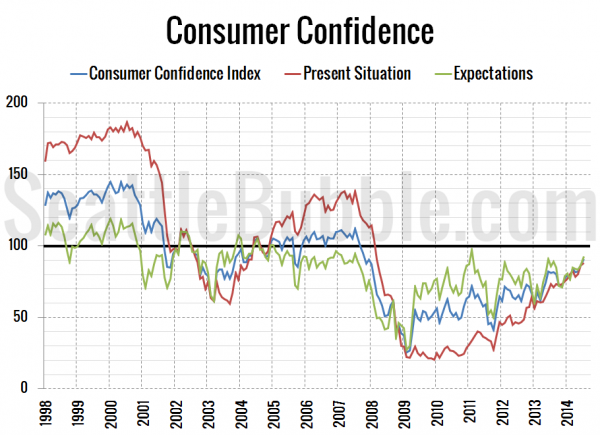 The overall Consumer Confidence Index currently sits at 90.9, up 5 percent in a month, 12 percent from a year ago, and at its highest point since October 2007. At 88.3, the Present Situation Index increased 2 percent between June and July, and is up 20 percent from a year earlier. The Present Situation Index is currently up 337 percent from its December 2009 low point, and sits at its highest level since March 2008, but still down 36 percent from its pre-bust peak in July 2007. 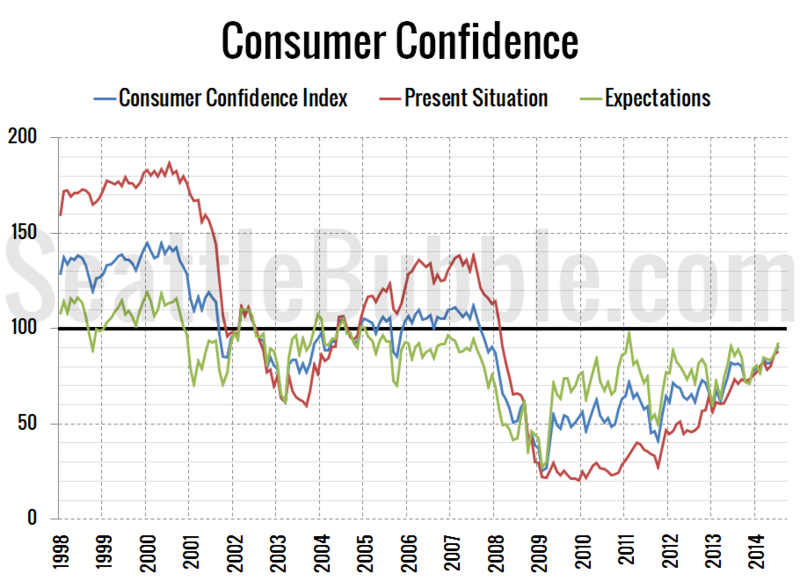 The Expectations Index rose in July as well, up 8 percent from June, and 8 percent from a year earlier. 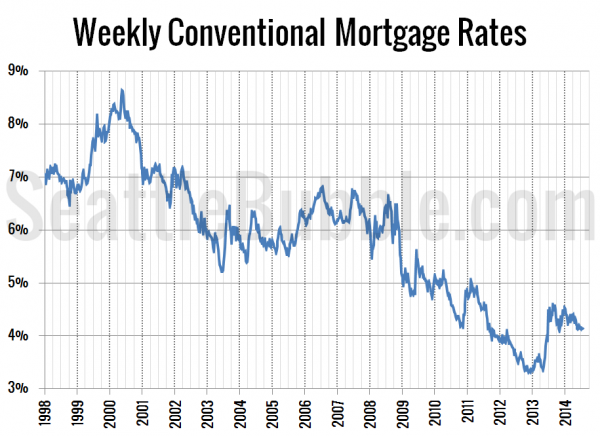 As of last week, the 30-year mortgage rate was at 4.12 percent, nearly unchanged since late May. Current interest rates are roughly on par with where they were in August 2011 and nearly two and a half points below the 6.41 percent average rate during the height of the housing bubble through 2006. BTW, its a FOX news show, but definitely not ultra-right wing….its moderate slanted, just the business facts for business planning mostly. 40% of American households had an income lost to unemployment in the last 5 years. During this same timeframe, 17% of American households have adults in parents’ basements and even elderly parents in kids’ homes because of unaffordable medical. The report when on to say that most of the American middle class missed the stock market profits since 2008, they pulled their cash out of stocks because their incomes are shrinking compared to the rich elite and needed to pay off bills. IMO, the forgotten “skewed by rich elite” average household income consumer confidence may have improved, the rich elite are buying stuff with stock profits, while the middle incomes eat cake.